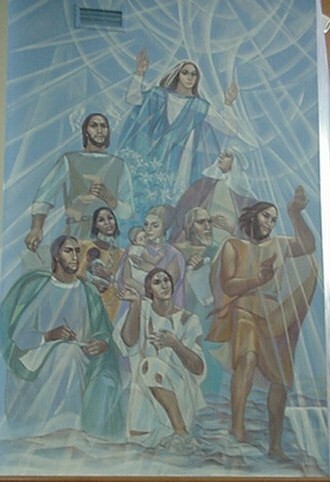 Artist Lillian Brulc was commissioned by St. Elizabeth Seton Parish to create the murals in their worship center. They had selected six walls, the subject “Communion of Saints” and a list of saints they would like to see in the artwork. Lillian based the structure of her designs on the form of the architecture: its space apportionment for liturgy, sacrament, and meditation/prayer, and its natural light. Beginning with an overall “ground” color of blue (the color most used to symbolize spirituality), she developed over it a vibrant sense of energy with intersecting white lines giving a dimension of spatial movement. She divided the saints into thematic groups and wove their images into the ground-line design. Angels, heavens, sun and moon, stars of heaven, nights and days, light and darkness, lightening and clouds, water creatures, birds of the air, beasts, all living people. 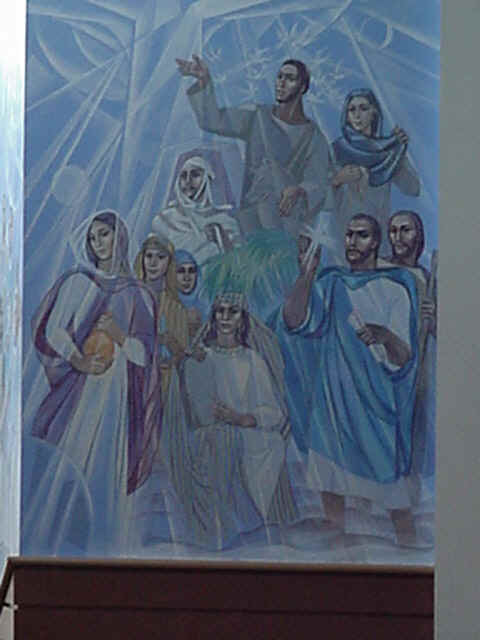 ​This mural faces the baptismal font/pool where new life in faith is born. Except for Perpetua and Felicity, all of these saints are biblical figures, some of the greatest in he history of salvation. Mary, encircled in the movement of the Holy Spirit, sings her praise to God. The Angel of the Resurrection indicates the empty tomb. The saints are preachers of the Resurrection, the event which is the center of our faith and the liturgy. This mural faces the center aisle toward the altar, where we give thanks for Christ’s death and resurrection. Mary Magdalene approaches the empty tomb, Francis looks up to the Cross which has become pure light. All but Francis and Clare are biblical saints. The image of cloud runs through the biblical books both as symbol of God’s presence and as its opposite. In this mural the saints climb the mountain of God, with a mysteriousness of cloud above them and the broken pieces of their lives left like shadows in the clouds below.